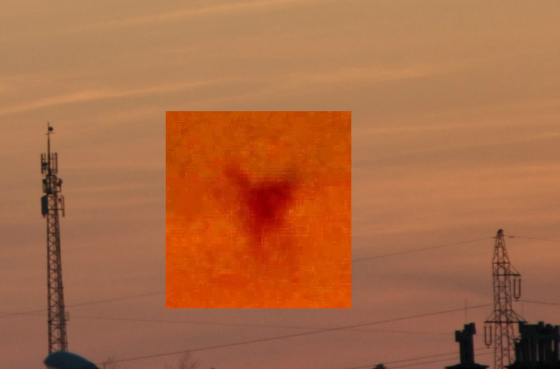 On April 14, 2018 in Ropczyce something that brings to mind a flying humanoid. That day, at 19:24, just after sunset, when entering the kitchen, I looked at the window that I had towards the SW. My attention was immediately caught by the distinctive dark moving point above the telecommunication mast. At first I thought it was a hang glider, because on Saturdays, often in the afternoon, two enthusiasts of this sport, when I looked better, I decided that it was something completely different. I quickly ran to the room for a reflex camera, set the appropriate parameters and made in the closest 4 photos, and then with a pair of binoculars I decided to take a closer look. 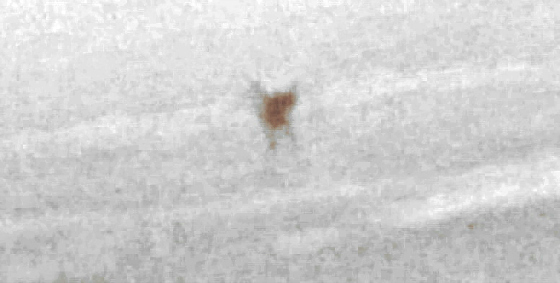 Interestingly, in the binoculars, I saw more clearly this "something" - it writes something because it had a shape like a figure, with the legs as if it were torso, and on the top like something like a protrusion. It was interesting that this strange object was made of light - dark fog, it was not a strictly physical object but like a 'cloud' of such shape that the 'cloud' was clearly moving in a straight line flight to the south, then turned right, changing direction, and after literally 20 seconds it disappeared as it was blown away. I knew that I was just witnessing something unusual. With 7x35 binoculars, I was able to 100% exclude a drone, a motor glider or a cloud of this shape. The distance to the mast from my window is 1.5 km in a straight line, and the "latad" was at this distance and moved south towards where in 2011 two huge UFOs hanging above the road were observed. Thanks to the photos that I managed. You can notice the unusual shape of the "latice", which resembles a humanoid appearance (body, outline of arms and legs). The entire event from the time of observation could take about 2 minutes. Someone may accuse me of a motorbike, a drone, or an inflatable toy. Of course, only that none of these things can suddenly disappear, and that's what I noticed in my binoculars a moment when the "lat" changed direction. Due to the fact that you can clearly see the telephone mast, you can determine the approximate size of the "latch", which could have compared to a visible barrier of about 2 meters. Height if it was at the same distance of course. I'm not sure that this is something "cosmic", but I know that it was something I have never seen in my life, something that brings to mind Mothman's thoughts, or other flying freaks. I would like to mention one thing that I have never written about. Well, around 2004-2007, I received information from some internet radio that was running the program about the unknown - unfortunately I can not recall the name because the information saved has gone to me during the failure of the hard disk. From what I remember, according to the information on their phone, it was recorded a female resident of Ropczyce, who told us that she had witnessed the observation of two winged figures who allegedly had to stand on the roof of an adjacent block at Grunwaldzka Street. The event took place around 3:00 at night. Unfortunately, the woman did not leave any bearing on me so that I could take care of this matter, which is why I give it as a curiosity, not a statement of fact. Of course, such a street really exists in my city and two buildings facing each other.